Hi everyone! Sorry to start posting with a fresh topic. I've been lurking here for a while, but there hasn't been much going on in the Original Starfire forum that would cause me to break my lurk-mode. Anyway, I just wanted to say thank you to everyone who helped make this release a reality. From Marvin to Cralis to everyone else who volunteered and/or supported the effort! You guys rekindled my love for the game and have given me an unforgettable experience! Thank you so much, you guys are awesome! jbanes wrote: Hi everyone! Sorry to start posting with a fresh topic. I've been lurking here for a while, but there hasn't been much going on in the Original Starfire forum that would cause me to break my lurk-mode. Please start more topics! While there are some players of the oldest versions, most don't discuss it on the forums. I would love to see more people talking about it! The fundamental issue with most table-top wargames these days... that's part of the reason why most Starfire games are solo these days. All we did was re-publish it. Very interesting... I do have to ask: have you tried using the miniatures and miniature rules with 1st edition? The smaller fleet sizes of the battles are ideal for it. Do you actually print and cut out those systems markers? Was that just so you didn't have to write it oit? Damaged systems are flipped over or removed? Wouldn't you need more boxes for larger units? So many questions I have! I can't afford the miniatures, but they would also work well with many of the scenarios in Stars at War once tactical level is triggered. Cralis wrote: Please start more topics! While there are some players of the oldest versions, most don't discuss it on the forums. I would love to see more people talking about it! Thanks for the warm welcome! It's nice to know that there are other folks interested! I've been lurking long enough to know that it took a little bit more than that! Can't say I have. I've been kind of working through the game a bit at a time. I kind of ignored the miniture rules for the time being since they require even more detailed record keeping. But since you suggested, I'll look into it! Do you actually print and cut out those systems markers? Yup. Printer paper, adhesive, chipboard, and scissors. Rounded corners are kind of painful, but they look so nice in person. Was that just so you didn't have to write it oit? That was definitely part of it. I've been trying to figure out ways to make record keeping more efficient. So I've been doing experiments with tokens and play cards. Trying to figure out how best to track the impulse, easier ways of tracking damage, intuitive support of ship construction, etc. Damaged systems are flipped over or removed? Yup. They get removed when the system is destroyed or pushed above the box when partially damaged. The chipboard counters have a good feel to them, so they're really easy to manipulate. Wouldn't you need more boxes for larger units? Note the corner where it says "FG". The ship type is built into the card with different cards having more or fewer boxes. This was to support hull unit allocation for the ship type. The problem with the standard rule set is that on some ships the engines are only half a hull point. I worked around this by stacking them. Then I got to the multitracking and realized I'm going to have to keep thinking about this. Tweaks to the rules may be necessary to achieve what I'm trying to do. It's all experimental at this point, so no worries! I'm happy to answer any questions. The next article in the series is intended to discuss some of these experiments with pictures detailing what I'm doing. Hopefully I can get it done this weekend. Well back in the day, I used to just write out the ship codes on 3x5 cards, with new ones for each game. These days when I'm doing something like that I print the lists out, then put the page into a plastic sheet protector. Then you can use a wet-erase marker to cross off damaged systems and such like. U - for Uranium bomb! Sekundar wrote: Well back in the day, I used to just write out the ship codes on 3x5 cards, with new ones for each game. These days when I'm doing something like that I print the lists out, then put the page into a plastic sheet protector. Then you can use a wet-erase marker to cross off damaged systems and such like. Amusingly I just started going back to cards. Gives a nice unique feel to the ship, now I do not want to loose them! The miniatures are designed to play 1" = 1 tactical hex, to be showy. My kids won't touch the counters but they like the miniatures. I'm working on painting, prepping, and figuring out how to transport them so I can start doing demonstrations! I don't recall if jury-rigging or other repairs are in the "original" editions, but of so a destroyed side would let you keep the order and easily see the whole state of the unit. The QSR rules are similar to the Original Editions, so I was thinking ship cards like these would be neat for the demonstrations. But what matters (for the QSR rules) is the order of systems, not size, since they all take 1 point to destroy. But I think you're using this for ship building too... interesting. In that case, special thanks to Dazrand for putting in the time and effort! I really appreciate it! The only (optional) rule in the original game was for shield regeneration. While I haven't been playing with that rule, I have considered how best to account for it in the player mat design. Indeed. The rules are the same in the original game. My solution to balance building and damage was to size the token for the number of hull points. Thus the laser takes up four spaces but there's only one token. You feel it when you take a hit on that! The idea of destroyed counters has occurred to me. I agree they could be pretty cool! 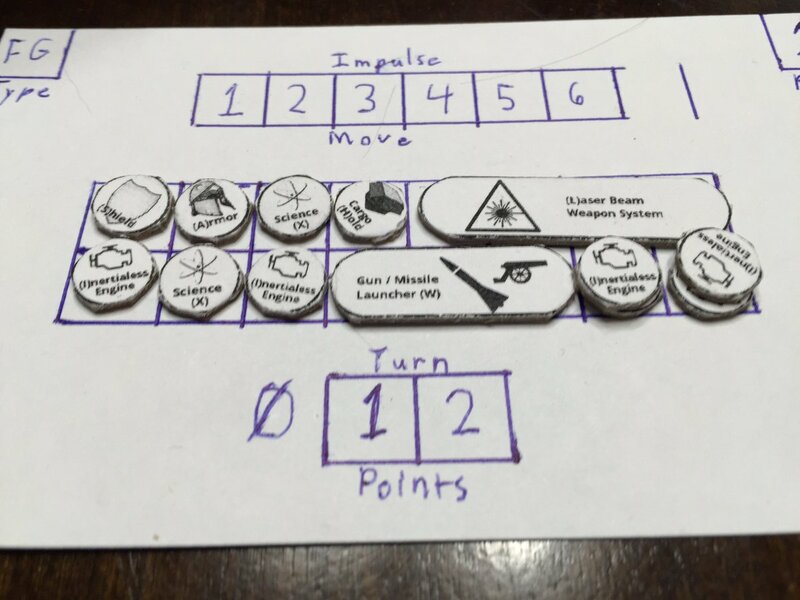 Of course, double sided counters are harder to prototype and are a lot more fiddly than simply removing the counter. Trade offs. I'm really glad I was able to provide some inspiration! I hope it's not too sacrilegious, but my own inspiration is along the lines of "Tiny Epic Galaxies meets Starfire". I love the way Scott Almes is able to work the components down to the minimum need yet maintain shockingly good quality. My own gaming group played TEG after Cosmic Encounters and were really impressed at how high the component quality of TEG was compared to CE! I hope I won't disappoint! Transporting miniatures is actually easy. Plenty of companies make carrying cases with customizable foam inserts. Easy to adjust for different sizes/shapes as long as the depth isn't greater than a single layer of foam. In this latest article I discuss my experiments with player mats and tokens in more detail. Please let me know if you have any questions, thoughts or suggestions!